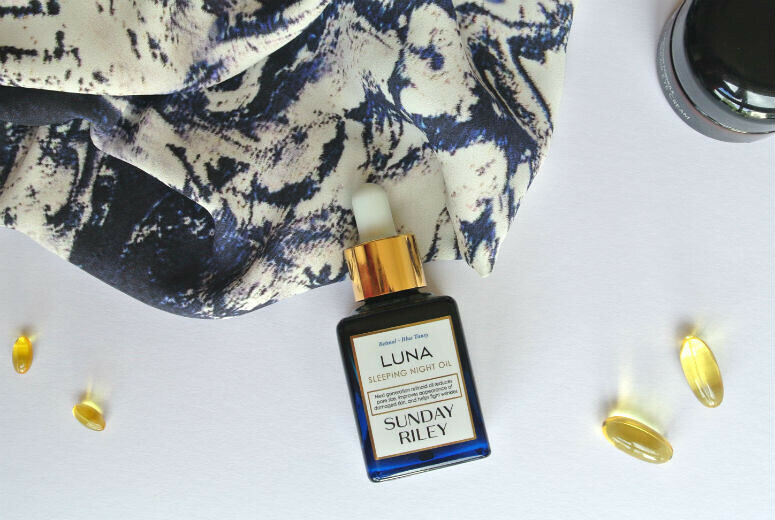 I won't doubt that you've seen reviews of the Sunday Riley Luna oil all over the place now, but I wanted to write about it from the point of view of someone who has never used retinols before. I've never used retinols ever in my life, although I've always been intrigued by them. A good topical treatment for acne, wrinkles, dark spots etc, it seems like they're a do-it-all treatment for skin, while still maintaining a general aura of being scary? The myths surrounding them put me off for a while though, and I was always worried they would be too harsh on my very senstive skin. After reading through these posts by Caroline Hirons here and here, I decided however to give the recently launched Sunday Riley Luna a go. Not only would I get to start using a retinol, I'd also finally buy myself a Sunday Riley oil product. Win-win here. The oil comes in a lovely big square based bottle-my favourite kind for storage. As a someone who is a little OCD about stacking and piling things, a square shaped bottle is my kind of perfect bottle, because it's so easy to stack with no space-wastage. The oil itself is a deep blue, as a result of the Blue Tansy oil, and it smells lovely. Herbaly and fresh without being overbearing, something which has put me off the other oils in the range. As for using it, I find this as my second to last step in my routine, post toning/essencing (I'm making this a verb now) and serum, and pre moisturising if I do decide to moisturise that night. I do however leave at least 15 minutes between the oil and moisturiser, just to make sure it's completely sunk in, because it's quite a thick oil. Results wise, I would say that it is quite hydrating and soothing to apply. I wake up with fairly refreshed looking skin, and I would definitely say that spots have been appearing a lot less since I've been using this. In terms of fading scars, I think it might be the reason my scarring is looking less dark, but only marginally. I will have to see how it deals with scars on a longer basis, but it may just be the case I need something stronger for that, which for is something I am wary about. Quite importantly though, I haven't had to deal with all that much irritation, which is great for someone who has sensitive skin like me. I went a bit overboard in the first week I got it, and put it on each night (eek) for about five days, before realising and deciding the best thing for me would be to use it two-three times a week. Since then, it's been smooth sailing. The only bad thing I would have to say about this product is the price. As with Sunday Riley, it's a steep £85. Even writing it makes my eyes water. On the plus side though, you really don't need much, one-two drops really is all you need, three if you feel like treating yourself, and since you won't (you really probably shouldn't) be using it each night, it should last you a good long while. If you're looking to try out a retinol for the first time, and want to break yourself in gently, then this is definitely the product for you.